Tis the season for holiday cookies. Peppermint, chocolate, shortbread and, my new favorite, butterscotch spice cookies! In my house, December is synonymous with cookies—because the holidays just aren’t the holidays without tons and tons of baking! Part of what’s so great, though, is that holiday baking doesn’t have to be fussy. Sure, things can get a little complicated if you go the icing route, but you don’t have to go there if you don’t want to. Really, all you have to do to get in the spirit is have fun with timeless holiday flavors like cinnamon, cloves, peppermint, chocolate, butter and, of course, gingerbread. Though it may not be traditional, I’d like to add butterscotch to that list. (Thank you, very much!) Not only does it make a great holiday flavor on it’s own—all warm, sweet and buttery—but it also beautifully compliments holiday spices, giving them an irresistible richness and depth. And these cookies are proof! 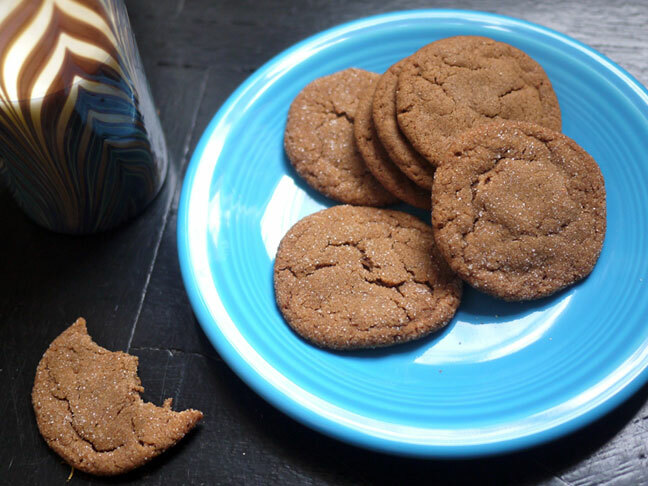 They taste like gingerbread with a twist. And the texture? Chewy on the inside, crispy around the edges. And despite being quite thin, they manage an almost fudgey center. Cookie swap material if there ever was. Oh, yes. 1. Line two baking sheets with parchment and set aside. In a medium bowl, combine flour, cocoa, ground ginger, cinnamon, cloves and cardamom. 2. In a separate large bowl, beat butter and brown sugar with an electric mixer until light and fluffy, 3-4 minutes. Add molasses and beat until combined. Set aside. 4. Heat oven to 325 degrees. Roll dough into 1 1/2- inch balls and roll in granulated sugar. Set about 2” apart on the prepped baking sheets. Bake for 9-10 minutes. Let cool for 3 minutes on the cookie sheet before transfering to a wire rack to cool completely.